Discussion in 'Skydentify - What is that Thing in the Sky?' started by skephu, Feb 24, 2016. What is this? I can't find anything like that in the atmospheric optics resources. 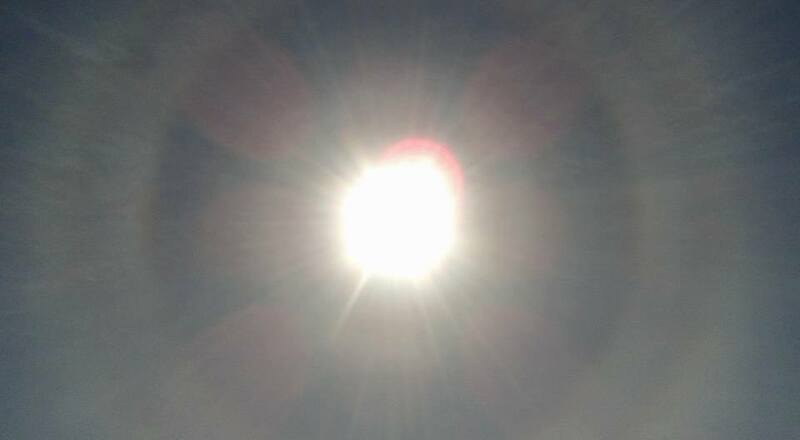 It appears to be a solar corona, possible with a 22° halo in the mix. Edit, now it appears to actually be an additional halo. Oh. Do you recognize that line-shaped cloud in the photo? It's the one Marin B posted in the other topic. At least it's extremely similar. I think the inner, smaller ring (or rings) may be a corona. But the two outer rings seem to be too large for that, their edges are too sharp for a corona (and the spacings and the colors don't match a corona either). 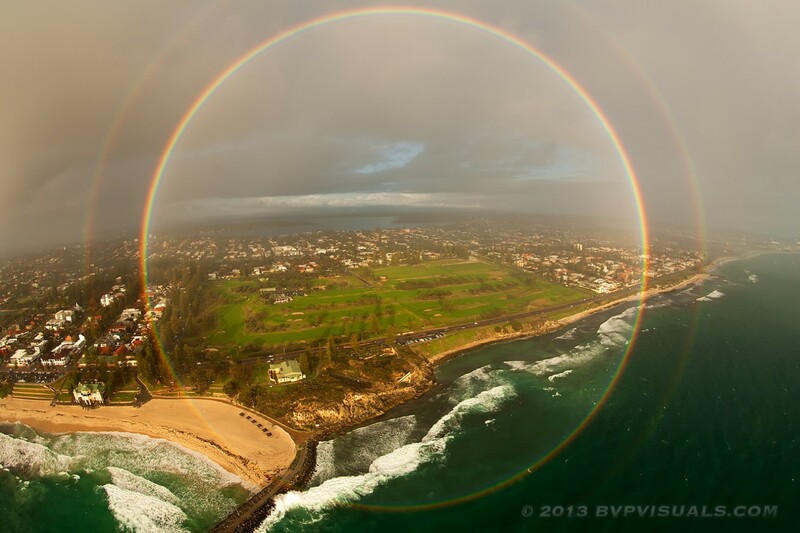 One of the outer rings must be the 22-degree halo, but what's the other one? It looks like the 22-deg halo repeated. Their inner edges are reddish, as it should be for the 22-deg halo. 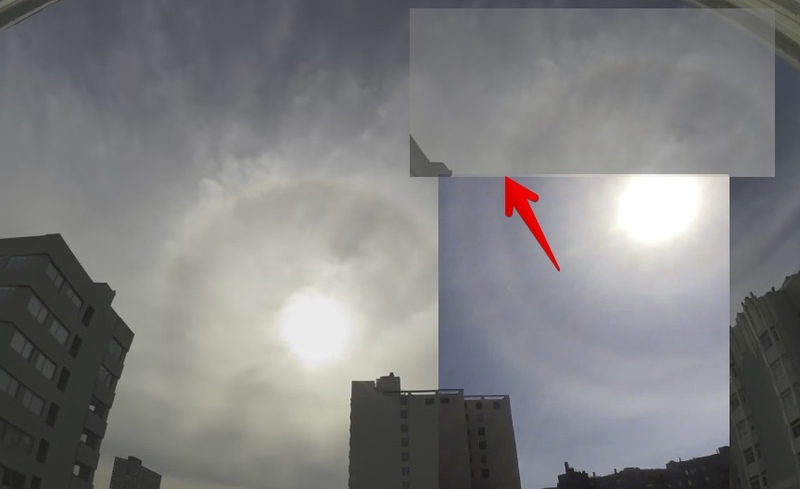 Comparing to an actual 22° halo from one of Roddie's excellent time-lapses(on the left, and a section over the top right), from the same viewpoint. The indicate ring does match a 22° halo. EDIT: This seems to be inaccurate, due to camera distortion . The time-lapse lens is a bit fisheye, so the buildings don't line up exactly. Andrew J. Weinheimer and Charles A. Knight: Scheiner's Halo: Cubic Ice or Polycrystalline Hexagonal Ice? J. Atmos. Sci., 44, 3304–3308. 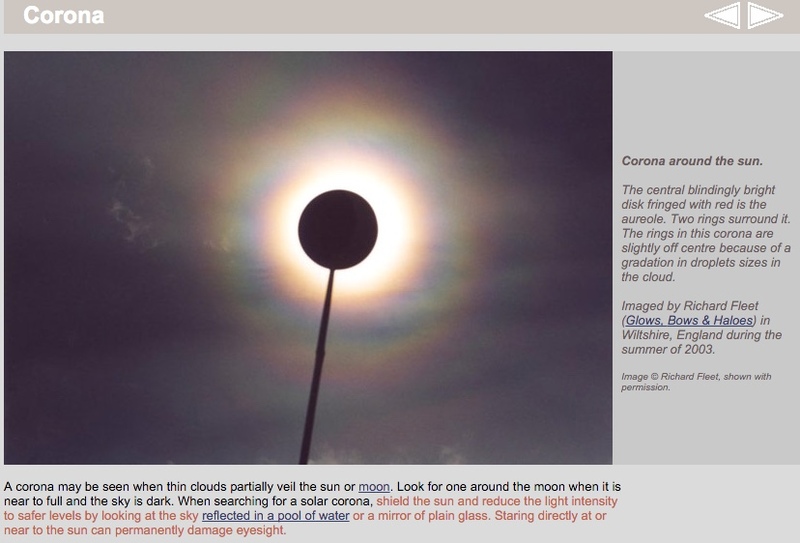 A new explanation is proposed for the rare Scheiner's halo, observed in the sky at an angle of 28° from the sun or moon. The existing explanation invokes the presence in the atmosphere of the cubic form of ice, ice Ic. However, extensive laboratory work has not demonstrated that ice Ic can form under conditions found in the atmosphere. We point out an alternative, that polycrystals of ice Ih (the ordinary hexagonal polymorph), in which specific orientation relations exist between adjacent crystals, are another possible cause of Scheiner's halo. Polycrystals with the appropriate orientation relation are not uncommon in the atmosphere, but concentrations sufficient to produce optical effects are expected to be rare. There appears to be no decisive evidence to rule out either of these explanations. 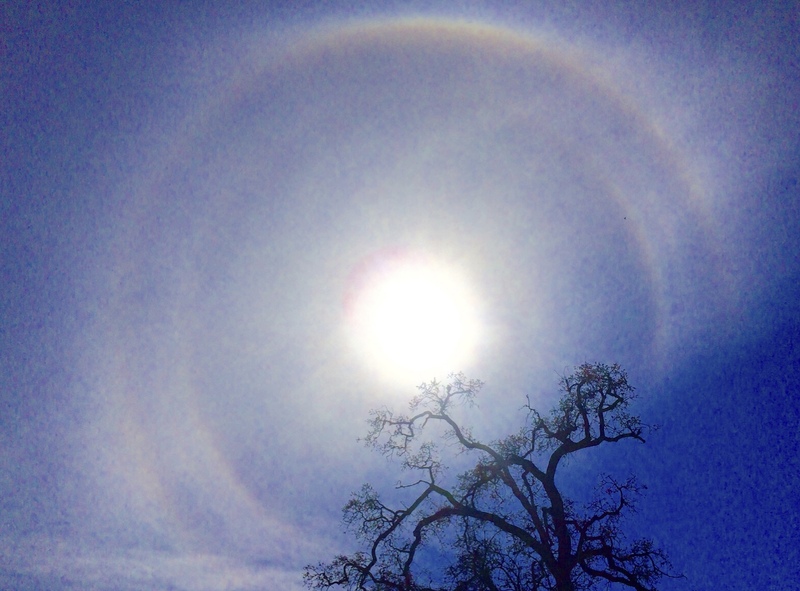 A rare halo around the sun or the moon sometimes appears at 28 degrees instead of 22 degrees. But don’t stay up late gazing at the full moon to see it. This halo, called Scheiner’s halo, has been reported only seven times in the last 350 years. 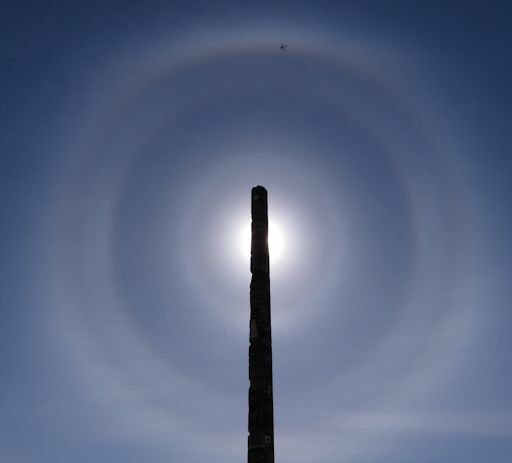 Scientists know that such a halo could be caused by octahedral, or eight-sided crystals. 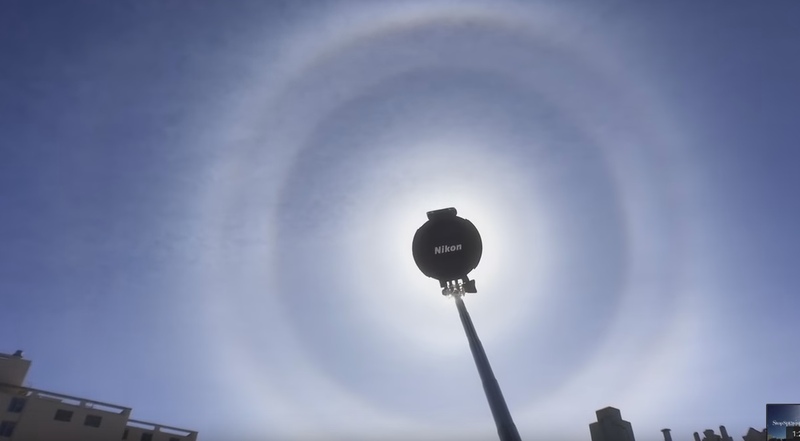 What crystals could cause this 28 degree halo? The mystery was recently solved by scientists working with cubic ice. Cubic ice is an unusual form of water ice. When water is frozen at temperatures of 100 below zero it forms octahedral instead of hexagonal crystals. They used a little math to show that octahedral water crystals could cause Scheiner’s halo. Scientists are now trying to discover whether conditions in the upper atmosphere could actually form cubic ice. Now if this thing has only been reported 7 times in the last 350 years, and Patrick Roddie observed it then he can really say it is incredibly rare! 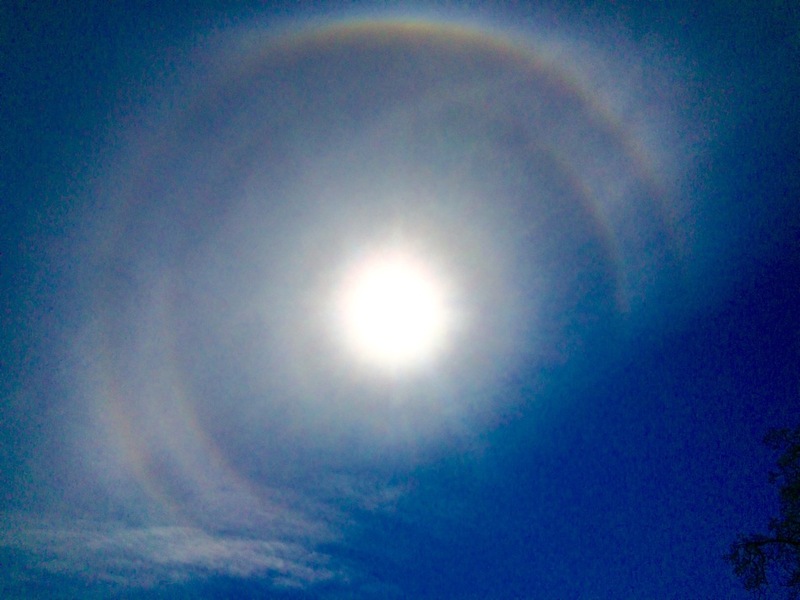 Could it really be a Scheiner's halo along with a 22-degree halo along with a corona? If yes, that's really an extraordinary phenomenon. Awesome! It looks like it is actually an additional halo, made with cubic ice! Check out the colors here. I've never seen this before, pretty amazing capture, congrats! I wonder if the inner small ring is actually an artifact of Scheiner's halo, an addition small inner halo that's not normally well observed unless the sun is occluded. 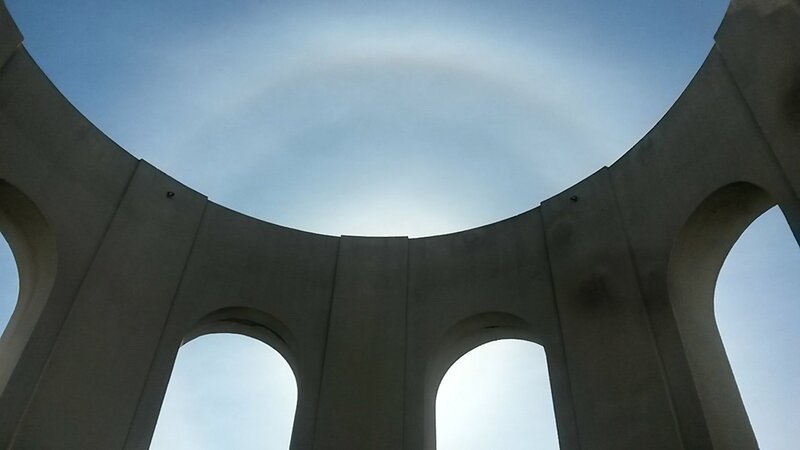 6, 9, 12, 18, 20, 23, 24, 28, 35-degree halos. Unfortunately most of the image links are dead on that page. So the smaller inner rings may also be halos rather than a corona. Actually there were three circles around the sun, and a very, vet faint fourth one http://spaceweathergallery.com/indiv_upload.php?upload_id=123044 You may read more about your display here http://www.atoptics.co.uk/halo/pyrhalo.htm A very good catch! I know this one. It is extremely rare. I was fortunate to see it in 1974. Through the medium of the Roy Met Soc magazine Weather, I found others who had seen it. They all lived in a broad band right across southern England. I was the last witness as the Cs cloud moved eastwards. Three of us wrote it up as a paper published in 1974. I refer to the paper The concentric halo display of 14 April 1974, by E.C.W. Goldie, G.T. Meaden and Richard White. WEATHER Volume 31, 304-312 (1976). As you know the commonest halo is the 22-degree one, and the 46 halo is very infrequent. The ones that I saw between 1840 and 1905 GMT were estimated as 9, 22, 24, and 26/27---plus also the upper arc of contact to the 22 one. Other observers also saw haloes at 18 , 32 and 46. Twelve observers in all. Furthest east was The Hague in Holland; furthest west was me in Trowbridge. We published sketches and examined the physics of the situation. We wondered whether numerous earlier condensation trails produced the pyramidal ice crystals of the cirrus and cirrostratus clouds. Last seen 1974. Now that's "incredibly rare". Of course with so many halos, it becomes harder to argue that it's all just ice crystals. Well, except that this is unlikely to be seen again in the next several years. 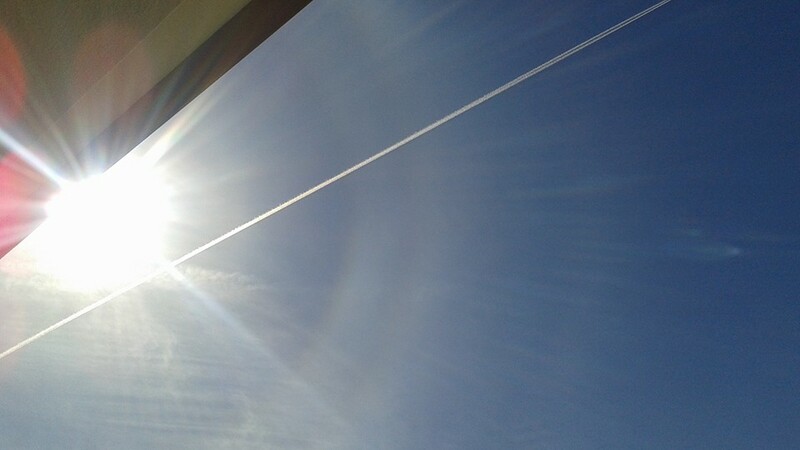 So unless chemtrails have only been sprayed on this one day, then it's all ice crystals. 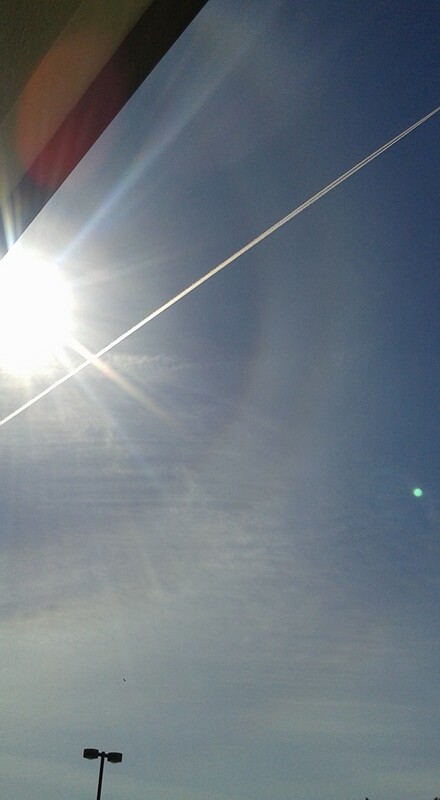 And of course these halos are explained by ice crystals, just odd shaped ones. This is where I really get hung up on 'chemtrails'. By choosing to ignore the science, one misses out on the truly strange and beautiful parts of meteorology. The real explanations of phenomena like this are so much more interesting than arguing over pylon drains and ballast barrels. This phenomena was unusual enough to make it into todays www.spaceweather.com and explained as "tiny pyramids of ice", so it looks like you all were mostly spot on, and again the chemmies are a little off the mark. About 100 miles away in Ballico, California, Richard Sears witnessed a similar display. 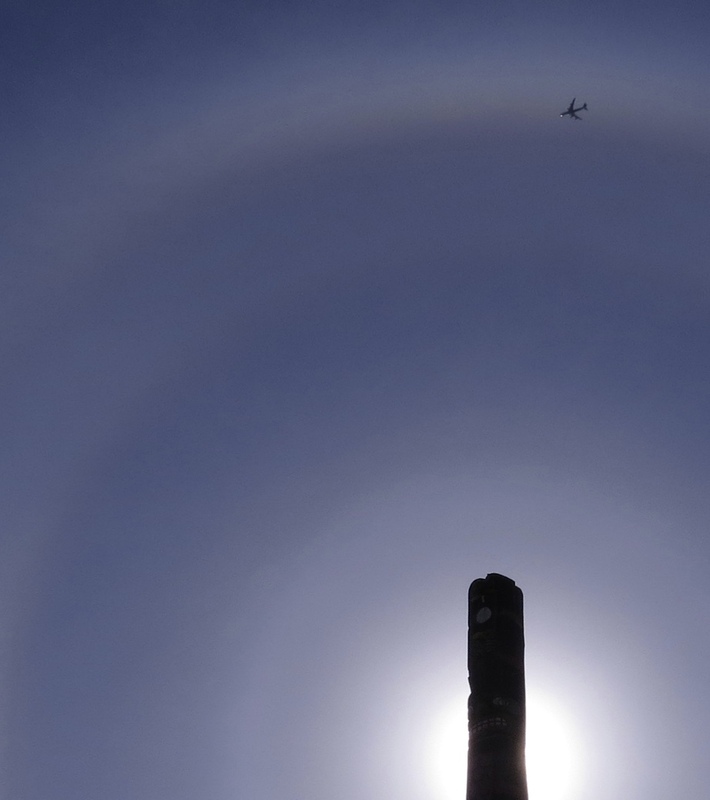 "I've been photographing sun halos here in California for years. I must say, this is the first," says Sears. "I wonder what is going on here?" The answer: The air was filled with tiny pyramids of ice. Atmospheric optics expert Les Cowley explains: "These are magnificent and rare displays of pyramidal crystal halos. 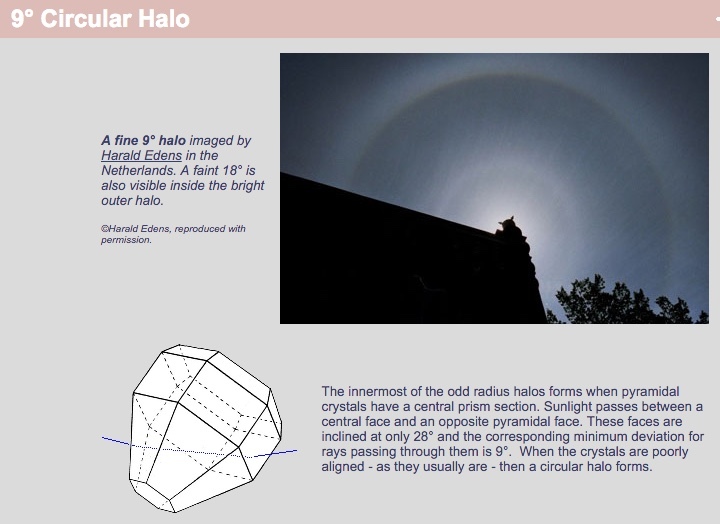 Ordinary halos are made by six-sidedcolumn- or plate-shaped crystals in high and cold cirrus clouds. Over California their ends were capped with pyramids. The pyramids always have fixed angles set by planes of atoms in the ice. Light passing through them form 'odd radius halos' 9, 18, 20, 23, 24 and 35 degrees from the sun. On Mila's image I can see a bright 9 degree ring, an 18 degree one and then a clump of twenty-something radius halos." "On Mila's image I can see a bright 9 degree ring, an 18 degree one and then a clump of twenty-something radius halos." That's a different assessment from what we arrived at. From Mick's comparison with an earlier photo by Patrick Roddie, we found that the inner outer ring is the 22° halo, and in that case the outer one must be at 28°. But if Les Cowley is right then the inner one is at 18° and the outer one should be the 22°. and we assume that it's at 35° then Les Cowley's assessment is right. But maybe it is the 46° halo, and then our assessment may be the correct one. Hard to decide with such a large choice of possible halos. Is there a time stamp? I could not find the original. Found the original photo on his Facebook. It was posted at 22:54 GMT (14:54 PST). Okay, I finally have to ask. Circles are 360 degrees, so how can there be a 22 degree circle? The definition for the sun halo says it's 22 degrees from the sun, but it surrounds the sun completely, so what does that actually mean? I get it seems to be referring to distance from the center, but don't understand how it's measured or why it's expressed as a degree. It's the angle between the sun and the halo. So is a rainbow half of a 180 degree halo? No. 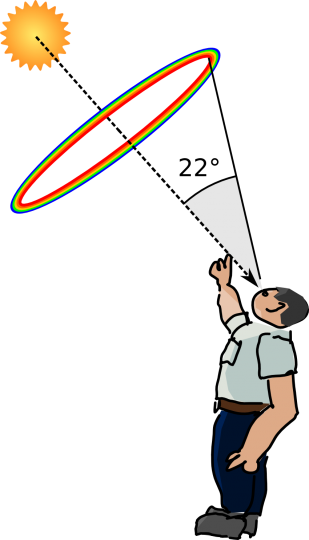 A rainbow is at ~41 degrees from the anti-solar point, so it would be a 180-41 = 139-degree halo. As @skephu says, it is a measure of the diameter (or radius, in this case). If you don't know the distance of an object (or, as in this case, it is not a physical object) then the only way you can express its size is in degrees: the amount of the field of view that it occupies. Rainbows are 42° you can generally only see half of it because the rest would be underground. If you get high enough you can see the whole thing. Well, kind of. It would be a line bisecting the sky between the sun and the point opposite the sun. At sunset or sunrise it would pass directly overhead. No, it would be point of light opposite the sun. You are right, I was confusing diameter with radius. That would be a 90 degree halo. The photo has been taken from the roof of the building listed as his address. Adding it to Google Earth also matches the Sun position, suggesting that the photo was taken shortly before it was posted on Facebook at 2:54 PM EST. My comparison might be a bit off, the non-rectilinear lens used for the time-lapse (note the curved sides of buildings) might be distorting things more than I thought. Luckily Patrick has quite a collection of photos from similar locations. OK, so then the outer ring is not Scheiner's halo after all. That's better because Scheiner's is too rare. Yes, I've removed "Scheiner's" from the thread title. It's still a very interesting and unusual halo display though.